I told you I'd be back in a year's time. With Aryon safe back in his tower and with all inhabitants of the island maximising the efficiency of their travel, it was time to approach a new challenge and create some more pretty pictures. The next question was simple: where the hell are all the people and what do they do? 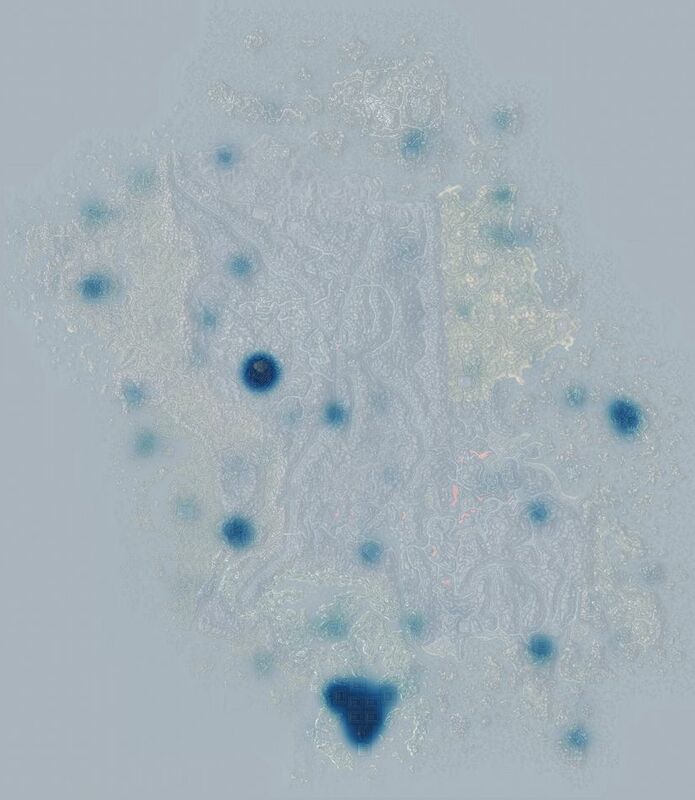 Let's try and use our cool matrix that converts in-game coordinates to coordinates on a map to its full extent and create some sort of a population heatmap. This isn't difficult to do since we already have all the pieces of the puzzle: we know where all the NPCs are located and what their occupation, race and gender are. The only problem is dealing with NPCs that are in the interior: remember how interiors are completely separate mini-worlds? This means that we can't simply infer someone's location in the exterior by taking the coordinates of the two doors and adding up an offset of the NPC from the door, since interiors often are bigger on the inside than what they look like from the outside. Since we'd only be looking at a world-scale overview, I decided not to bother with precision: the actual exterior location of an NPC is simply the location of the closest exterior door they can get to (by number of cells they have to traverse to get outside). Armed with these tools, I went through all the NPCs in the world, getting their exterior location, and converted that location into coordinates on the map. I had a map-sized matrix where I accumulated those coordinates: the number at each pixel was the number of NPCs whose exterior coordinates fell within that square. 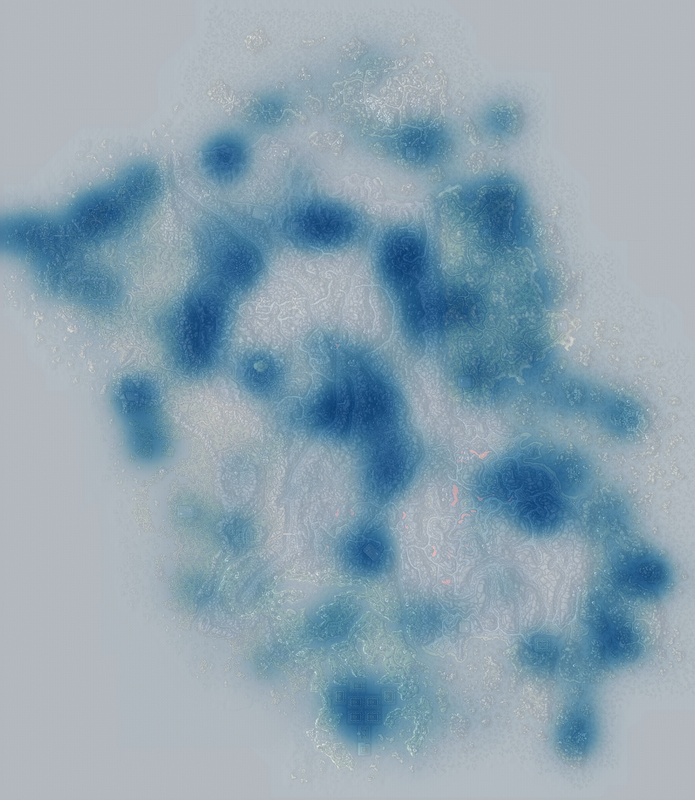 This meant that I'd get disproportionately large amounts of people piling up at the doors of densely-populated interiors, which wasn't optimal as it was difficult to see on the image (after all, it's just one pixel) and wasn't representing the in-game reality well: after all, we are interested in the population in a given city/region and people don't really stand in one spot either, instead roaming around. Hence I applied a Gaussian blur to my matrix so that instead of 10 people assigned to one pixel we'd be looking at something like 2.2 people on that pixel, 1.1 people one pixel away, 0.5 people 2 pixels away etc. If this feels like chopping people into parts and throwing those body parts around so they form a nice hill, it's because it kind of is. I didn't really have a methodology here: varying $k$ changes the steepness of the curve (how quickly things go from the left side of the colormap to the right side, getting brighter) and varying $c$ changes where it's centered, so I tinkered with them for each picture until it looked good. With that in mind, let's see what we ended up with! We get dark blobs in large population centres like, bottom to top, Vivec (and Ebonheart next to it), then Balmora (southwestern part of the island), Sadrith Mora (far east), Ald'ruhn (north of Balmora) and Gnisis (northwest of Ald'ruhn). There are also some minor places highlighted around -- these are either smaller settlements or larger dungeons/strongholds/shrines. 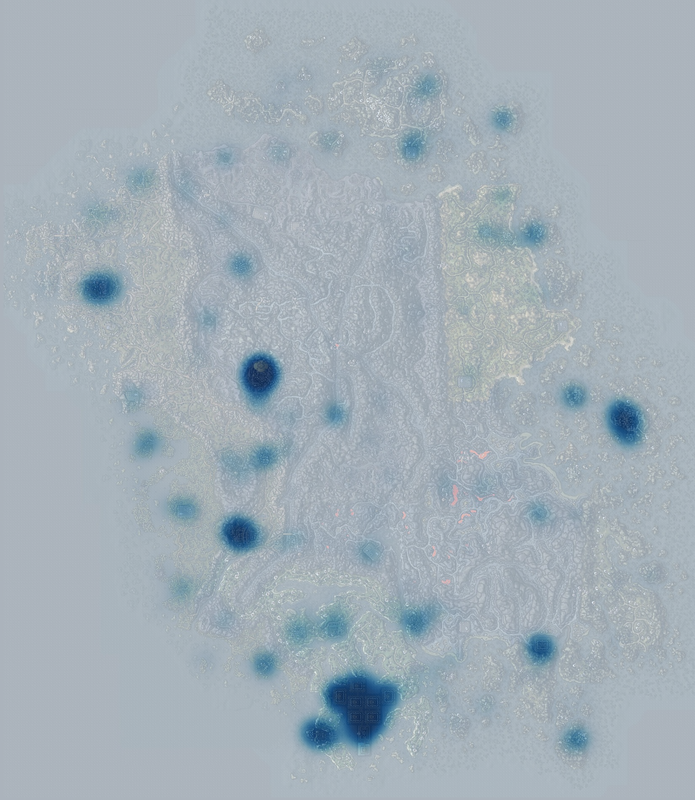 I did have to play around with the parameters for this one (increasing the blur radius and moving the centre of the sigmoid to 0.5), but we can sort of see how the Dark Elves (natives of Morrowind) are less represented in the southwestern part of the island (which is more cosmopolitan and welcoming towards foreigners) and more represented in the eastern territories as well around the Ashlander camps (which almost completely consist of them). No blobs around big cities and towns -- which makes sense since this is a relative fraction. 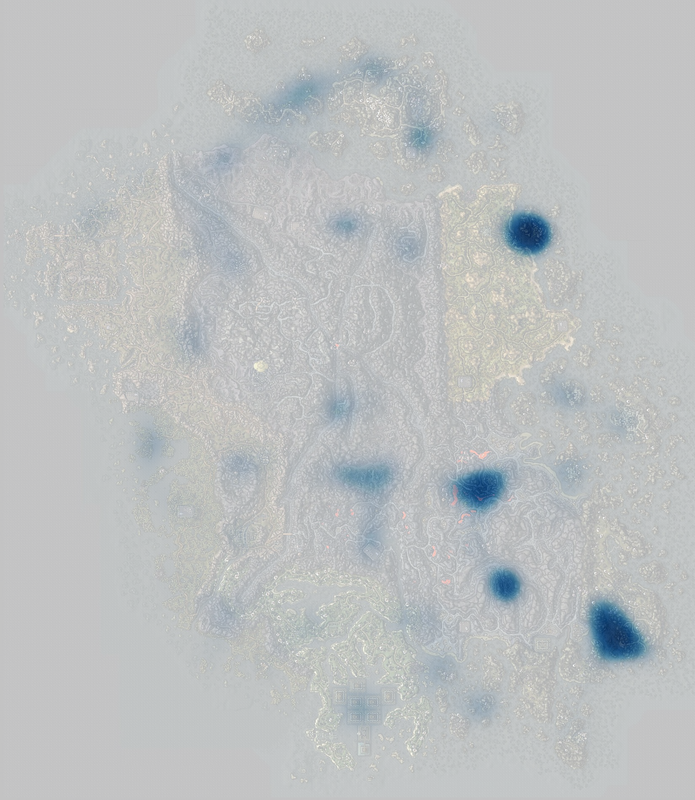 Instead what we have highlighted for us are random dungeons and plantations around the world where slaves are held, including Abebaal Egg Mine or Dren Plantation or some slave markets or Rotheran or Hlormaren (interestingly, for the latter the blob (west of Balmora by the sea) is west of the actual stronghold -- this is because the slaves are held in sewers from where the exit is around there). There are very few places on the island where females are overrepresented (note I set the centre of the sigmoid at 70%) -- the only one of them that's a town is Tel Mora in the northeast. That's because the councilor of that town "does not enjoy the presence of men" and all residents of that town are indeed women. 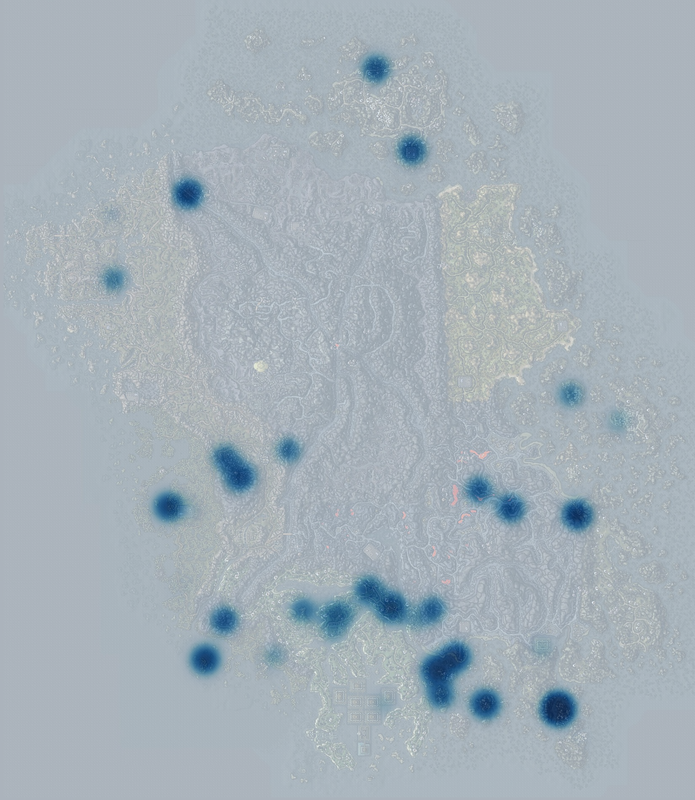 Another place is Odirniran in the southeast, a Telvanni stronghold under attack by House Hlaalu. Northwest of that we have Assu with two sorceresses and north of that is Tel Uvirith -- a stronghold that gets built for the player as part of the Telvanni questline. It's disabled at the start of the game (and is invisible), but the scraper obviously didn't care about that. Next year on project Morrowind, I promise I'll actually get around to cleaning up the source code that was used to make all this and releasing it. Promise.